What's New for the 2019 GMC Yukon? 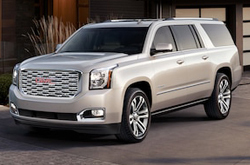 In the full-size SUV market, the GMC Yukon has been a strong contender since its launch in 1991. 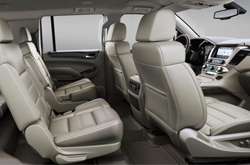 This large SUV has ample space for seven or eight passengers to feel comfortable on the road without sacrificing cargo space in the rear. It also has ample power for exceptional performance on the road, meeting all of your towing needs. The 2019 Yukon is included in the line's fourth generation, and it carries many improvements over the 2018 model. For example, two exterior colors have been removed, and four new exterior colors are now available. In addition, SUV shoppers can upgrade to a Graphite Edition or a Graphite Performance Edition. The Yukon from GMC is available in three trims for 2019. These are the SLE, SLT Standard and SLT. At the base level, the SLE comes with black assist steps, a manual liftgate, projector beam headlights, daytime running lights, fog lights, tinted glass, heated and powered side mirrors, 18-inch machined aluminum wheels, remote keyless entry, a remote ignition start, a three-zone climate control system, a color driver display center, a leather steering wheel, a 4G hotspot, an infotainment center with a color display screen, SiriusXM radio, a Bose sound system, cloth interior and more. 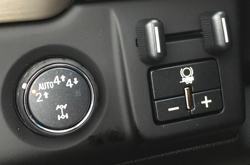 If you opt for the highest trim level for 2019, the SLT adds onto these features and gives you leather seating, a navigation system, a hands-free power liftgate, Intellibeam headlights, turn signals integrated into the side mirrors, keyless open, an auto-dimming rearview mirror, power-adjustable pedals, a heated steering wheel, a universal remote and more. We are ready to tell you more about the differences in standard and optional features across all of the 2019 trims. Which Drivetrain Options Should I Consider? When you decide to take home a large SUV, you understandably have high expectations for its power and performance capabilities. 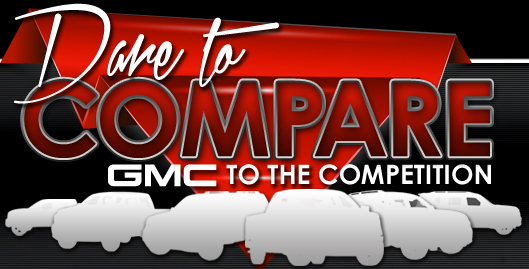 The 2019 GMC Yukon lives up to your expectations with a V8, 5.3-liter ECOTEC engine in all trim levels. It comes with active fuel management, and it offers up to 355 horsepower and 383 foot-pounds of torque. Other relevant features that impact the incredible performance capabilities of the Yukon include anti-lock disc brakes, powertrain grade braking, limited slip differential, electronic stability control with traction control, a front coil-over-shock suspension, a Premium Smooth Ride suspension, trailering equipment and more. The 2019 GMC Yukon is a vehicle that you can feel comfortable cruising around town in thanks to its many exceptional safety features. Some of these features include seven airbags, a deactivation sensing system for the front passenger's airbag, front and rear park assist, a tire pressure monitoring system, rear parking assistance with a rearview camera, the LATCH child safety system in the rear rows and more. 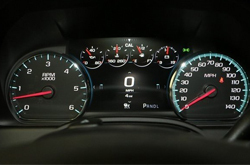 If you step up to the SLT trim, your 2019 Yukon also gives you a lane change alert, a blind spot alert, a rear cross-traffic warning, lane keeping assist with a lane departure warning and a forward collision alert. Schedule your appointment, or drop by at your convenience. We look forward to serving you! What’s In Store for the 2018 GMC Yukon Denali?